A selection of inflatable and foam based comfort seats, most of which do not require any modification to your folding kayak. If your folding kayak does not have anchor points for comfort seats that comes with side straps, you can purchase a set of 'Gunwale D-Ring straps'. 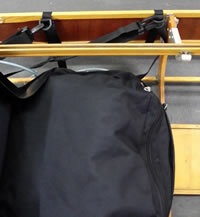 The Gunwale D-ring anchoring straps simply strap around the kayak's side ladders - position them forward of the seat's position. Sold in sets of four straps for each seat. Wrap the straps around the side frame ladders. Position the straps anywhere within the cockpit area as required to suit your ideal sitting position. This all in one Maxi seat has an inflatable backrest plus 1-2 inflatable bladders in the seat bottom. The whole seat can be zipped closed when not in use. 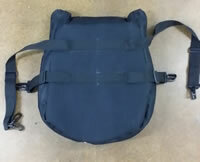 Includes separate set of 4 Gunwale D-ring straps. 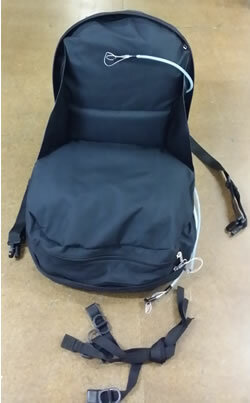 All in one inflatable seat - both backrest and bottom. Made of PVC.